President Donald Trump chided Sens. Jon Tester (D-MT) and John McCain (R-AZ) for voting against Obamacare repeal at a rally in Montana on Thursday night. President Trump said, “Jon Tester voted no on repealing Obamacare.” The Montana crowd replied with loud booing. Tester’s Republican opponent, state auditor Matt Rosendale, has slammed Sen. Tester for voting for Obamacare. “We would not have this catastrophe of Obamacare if it were not for Jon Tester,” Rosendale said in an interview with Breitbart News Daily last August. And even though we got a little surprise vote that evening, you all remember that evening somebody [McCain] came in with a thumbs down after campaigning for years that he was going to repeal and replace, but that’s ok because we, for the most part, we have already done it and we have great health care that just came out two weeks ago. 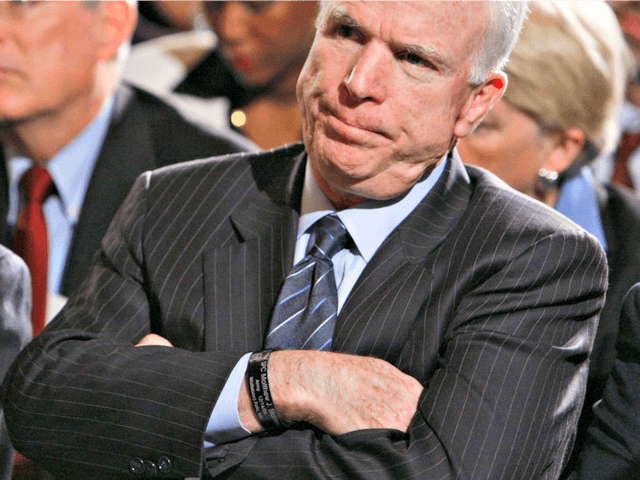 Sen. John McCain infamously tanked Obamacare repeal in July 2017 after campaigning and promising for years to repeal and replace Obamacare. McCain, alongside Sens. Lisa Murkowski (R-AZ) and Susan Collins (R-ME), shot down a second Obamacare repeal plan known as Graham-Cassidy in September. President Trump signed the Tax Cuts and Jobs Act in December, however, which repealed Obamacare’s individual mandate. Breitbart News reported that 80 percent of those who pay the Obamacare individual mandate make less $50,000 a year, making the mandate’s repeal a significant tax cut. “And we got rid of the individual mandate. Sometimes we have to do it the hard way,” Trump added. Trump then noted, “Jon Tester voted no on tax cuts for Montana families,” which was the legislation that repealed Obamacare’s individual mandate. The Trump administration released a new rule in June that expanded Association Health Plans (AHPs), which allows for small businesses and industries to band together and offer their employees more affordable healthcare options compared to Obamacare. An Avalere Health study revealed that AHPs would be roughly $2,900 lower per year compared to the small-group market and $9,700 lower per year compared to the individual market.